Mrs. Julia Mae Barnes, of 158 Blacksprings Road NE, Milledgeville, Georgia passed away on Friday, November 30, 2018 at Navicent Health Baldwin, Milledgeville. Funeral services were held on Wednesday, December 5, 2018 at 12:00 noon from the Stanton Grove Baptist Church, Sparta, Georgia. Interment followed in the church cemetery. Sister Julia Mae Barnes was born June 11, 1922 in Hancock County, Sparta, GA to the late Mary Cummings Edwards. Sister Barnes was educated in the public schools of Hancock County. She made her transition to heaven on November 30, 2018. Sister Barnes was united in holy matrimony to James Barnes, Sr. Together they raised six blessed children; three sons preceded her in death: Willie Lee Barnes, John Willie Barnes and Johnny Barnes. At an early age she joined Second Beulah Baptist Church and later moved her membership to Stanton Grove Baptist Church, where she served until her demise. Sister Barnes touched the lives of many. In the 1960's she worked for Dr. Freeman who later moved to Boston. He requested that Sister Barnes continue to work for him, therefore she moved to Boston, Massachusetts in 1966 and continued to work for Dr. Freeman another thirty years. He thought so much of her that he continued to pay her a salary for a few years after she moved back to Georgia. Sister Barnes was a faithful and dedicated woman of God. She prayed many prayers for those she loved and cared for. She always greeted people with a smile, kiss, hug and a "I love you." She often requested that her grandson, Rev. Elijah Barnes, Jr. sing "Tell The World That Jesus Lives" and loved to hear her son Rev. Elijah Barnes, Sr. preach the word. She had a heart for flowers and could tell you the name of each one she had and who gave them to her. 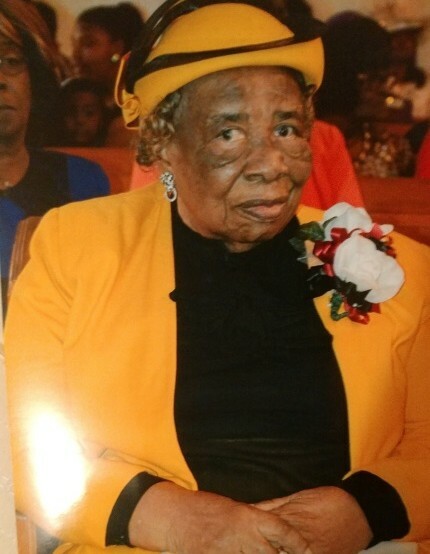 Sister Julia Mae Barnes leaves to cherish her memory three children, Rev. Elijah Barnes, Sr. (Eva), Annie Barnes-Brown of Milledgeville, GA and James Barnes, Jr. (Irene) of Boston Massachusetts; a devoted and loving great granddaughter whom she raised, Thelma Barnes; two daughters-in-law, Louise Barnes and Catherine Barnes, both of Milledgeville, GA; She also leaves to cherish her memory: 23 grandchildren; 33 great grandchildren and 18 great great grandchildren; devoted cousins, Dea. J. E. Cummings and Betty Cummings and Ruby Warren; devoted friends, Dea. Tommy Cleveland, dedicated neighbor, Dea. Mark Trawick, Jr.; a host of other relatives and friends.